11/29/2017—NASA 2018 Super Touring 5 Rules Released! As in past years, NASA Time Trial classing will mirror classing of the Super Touring and Performance Touring series, so TT drivers can use these rules for purposes of 2018 TT classing as well. The new ST5 class will be taking the place of the Performance Touring C class (PTC) this season, with a transition of the Performance Touring D class into ST5 as well in the future. Because of the disparity between the rules for the new ST5 class and the ST1-ST4 classes, it was decided to separate these rules into an entirely different rules file. While still written in an open modification format, these rules are more restrictive than the higher level ST classes, and there are more Modification Factors (some of which have transitioned over from the PT classes) that should serve to even the field at a lower cost to the competitors than in the higher level classes. While the limit of Adjusted Wt/HP Ratio is 14.00:1, competitors will see that there are significant differences between the higher level class rules, and that a direct comparison between the 14.00:1 in ST5 versus the 12.00:1 in ST4 would not be valid. As in the ST1-4 rules, there is now a rule (that didn’t exist in PT) that allows for reinforcement of suspension mounting locations for strengthening purposes only. Competitors will immediately notice that the entire system of tire sizing has changed to the “NASA Section Width” measurement, and that not only are there no longer Modification Factors for tire size in this class, but that tire size is limited based on the vehicle competition weight. NASA has developed its own method of measuring tire width, called the NASA Section Width measurement, along with measurement tools that will be available in every region and templates for those tools in a .pdf file on the NASA Rules page. We have added a Modification Factor for UTQG Treadwear 200 or greater tires as well. The new method of calculating the Average Horsepower (Avg HP), while a little more complicated, should provide a better approximation of the horsepower available over a range of usable RPM. As in the past, if a competitor does not want to do any of these calculations, the Maximum Horsepower can always be used to calculate the Adjusted Wt/HP Ratio instead! The improved method has more data points to be evaluated with a switch from looking at the HP in 500 rpm increments to 250 rpm increments. As well, the number of data points used for the actual calculation will depend on the engine’s rpm redline. Larger, lower revving engines will use less data points, and the smaller engines that rev higher will use more data points giving them a measurement of a wider rpm power band. Changes to the weight tables, new Modification Factors for Suspension, such as the “Upper “A-arm” or “wishbone” type control arms” Mod Factor, and the Drivetrain Modification Factor for “Rear-Mid or Rear engine layout” will all serve to take the place of the vehicle base class table in the Performance Touring rules. There is a Modification Factor for Front Splitter as the progression of decreasing Aero modifications continues down the series classes. As with any new class, we hope for perfect rules that serve the competitors, but we remain realistic and ready to make minor adjustments as needed. Your constructive input on the NASA Forums or via your regional series leaders is always welcome. Have a great 2018 season, and we will see you at COTA in September for the once again unified NASA National Championships! so. did i read the rules correct that because a car came from the factory rated at 300hp it can't be eligible for tt5? Yep. Has to be under 265. I think I saw somewhere that it was to prevent de-tuned cars. I honestly don't know, I have zero experience with de tuned cars that I know of. There is a lot t of discussion about them though, and I think it has something to do with how they can make the same power the entire width of the rpm range. I guess I get that, but since we use average hp not peak I don’t see that being a sensible reason. Also moving the dyno plot points from 500 to 250 rpm intervals actually hurts the number for peakier power bands, so saying to counteract a flat power and for fairness I don’t see. I think the reason, (and if I am wrong, someone feel free to correct me) is that generally a car that makes 200 peak hp will make about 100 at 3000rpm. for the sake of arguement. A de tuned car that makes 200 peak hp can possibly be making that same 200hp at 3000 rpm. So, out of slow corners the de-tuned car has an advantage. Less shifting, more power, etc. As far as the 250 rpm increments, there are different scales based on RPM. The higher the redline, the more points you get. So if you have a high reving engine, your high RPM power gets a few data points at lower levels (less power) to offset the peak numbers. If you have a high rpm engine with a flat curve, you will get less peak hp than a car with a steep curve. Overall, I think this is a great ruleset. I see some factors that work to my advantage, and some that work to my disadvantage. It looks like it is that way for everyone. Excellent job and THANK-YOU! to the folks that put in the time and effort to get these prepared. I think you have struck a nice balance that should incorporate both classes (TTD/TTC) well, keep the budget low, but still allows for some creativity. i know, thats my point. with the sti to run 275's in tt4 i would need fender flares as well as new wheels. Aaron, its not just about detuned cars. It is actually more about costs and to keep the class as a replacement for D and lower C cars. Your car, as an example, does not fit those criteria in the PT rules (yes, it was possible to run on street tires with no mods, etc..., but still not a lower level C car). Your car fits fine in every class from ST4 to ST1, and for the most part, the "natural" spot is in ST4 or ST3. Is the 265 factory HP limit based on the original engine or what is actually in the car? I assume that the standard foam rubber rear spoiler on a Porsche 944 is a "spoiler" as far as the rules go. Which disqualifies it for using the "BTM Aero" Modification Factor (6.1.4), and would require removal of the spoiler to run a wing in TT5 (6.1.5). Is that right, or am I off base? Can you take a chassis which originally had an engine with 300 hp and swap in a 250 hp engine? Can you take a chassis which originally had an engine with 250 hp and swap in a 300 hp engine? to compete in ST5 (section 4)." So, the answer to both is no. So looking at the rules, I realize I have to change my plans. The shock rule that adds a modifier for 40mm+ shaft diameters makes running the only suspension manufacturer that provides NASA contingency prohibitive/ impossible. Thant kind of stinks, as you can get a full AST non-remote set up for ~1500 less than an MCS set up. Even though the MCS is likely the faster set-up, the shaft diameter is smaller, thus no modifier. Kinda wish it were based only on remote/piggyback systems but it is what it is I guess. I'm also not the biggest fan of the current shock rule. I think it would be better if the rule just stated the max number of adjustments allowed before the modifier kicks in (single adjustable for ST5, in my opinion) and left it at that. The current rule allows a benefit to certain cars instead of putting everyone on an equal playing field and discouraging spending. 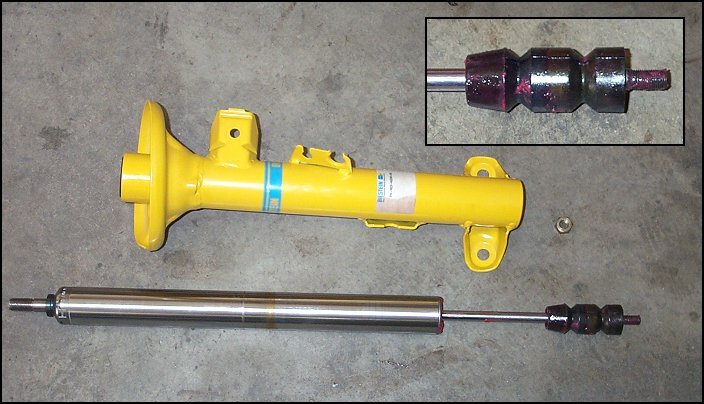 -The 90-05 Miatas have a really short rear shock and a single adjuster is all that will fit without adding an external reservoir. -The 2016+ Miatas have extremely long shock bodies and can package the hardware for a triple adjustable inside the shock body. So the 90-05 gets a -.7 modifier for a double adjustable, while the 2016+ gets to run a really expensive triple adjustable with no modifier. Doesn't make sense. My fortune auto coilovers are < 40mm shaft diameter and they have a good NASA contingency. Not sure if they have fitment for you. I have claimed contingency and have been happy with their performance. Technically, the shaft is less than 40mm, but I have always assumed the rule includes the shock body for inverted shocks.